A better, truer harem pant. 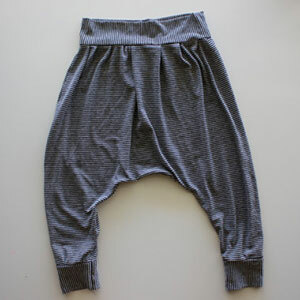 Your child is sure to love these for their comfort and style. They come together in no time at all, and are up for endless customizing (think pajama bottoms, yoga pants, etc!). Perfect for both boys and girls. This pattern is available in sizes 12 months through 7 years. 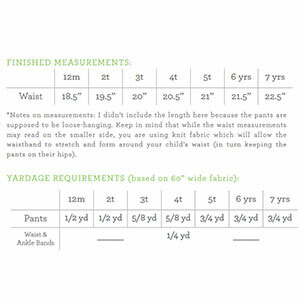 Suggested fabrics are light to medium weight knits such as cotton jersey, cotton lycra, french terry or ponte de roma.